We value your eye health and have the most advanced diagnostic equipment in order to throughly assess and protect it. Many eye problems can develop without warning and progress with no symptoms. Early on, you might not notice any change in your vision, but irreversible damage could be taking place. This is why regular eye exams including a thorough evaluation of the retina are so important. We’re trying to pick up signs of disease before permanent damage can occur. When eye disease is discovered, it means that eye health should be followed more closely. Offering a three-dimensional picture of the inside retina and retinal layers, OCT allows our doctors to make more informed decisions regarding treatment or evaluation of glaucoma, macular degeneration, diabetic retinopathy and much more. 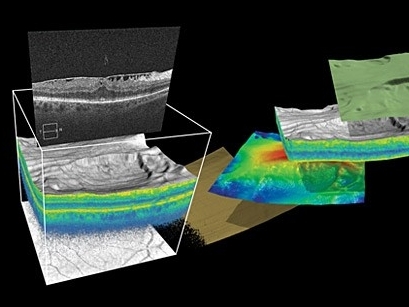 We have an instrument called optical coherence tomography (OCT) that produces high definition images of the layers of the retina (light sensitive ‘film’ inside the eye). Often compared to an MRI or CT scan, OCT images provide stunning details of retinal structures that are not visible with other examination techniques or tests. This is important because it enables the doctor to detect very early signs of vision-threatening disease, such as glaucoma, macular degeneration, diabetic retinopathy and others. When diagnosed early, these conditions are easier to treat, slowing progression and often avoiding vision loss. When most people think about their vision they focus on how well they can see things they are looking at. Most don't consider that our central vision (what we look at directly) makes up only a small part of our visual field we depend on all day. What we see in the peripheral is not as clear as our central vision but we use it to see things coming from around us, to not bump into things and even to scan ahead while we read. We do this all without ever thinking about it. It's only when there is a serious problem with our peripheral vision that we realize how much we should value it. Small losses are not noticeable but if caught early may prevent further damage.